How Do I Merge Two Contact Records? 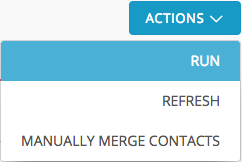 In Virtuous, Contacts may be merged via the Merge Contacts screen. If you do not see the Merge Contacts option in the left side menu, ask your system admin -- users may have restricted permissions. There are two ways to identify and merge duplicate records. 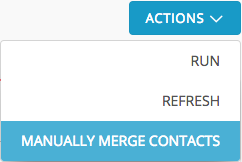 On the Merge Contacts screen, look for the Actions button in the upper right. Click, and then select "Run" to start an automatic search for any possible duplicates in the system. Potential duplicates will be identified based on matches by name, address, phone, or email. Depending on the number of records in your database, it may take some time to see results. The duplicate search will continue running in the background while you complete other work in Virtuous. 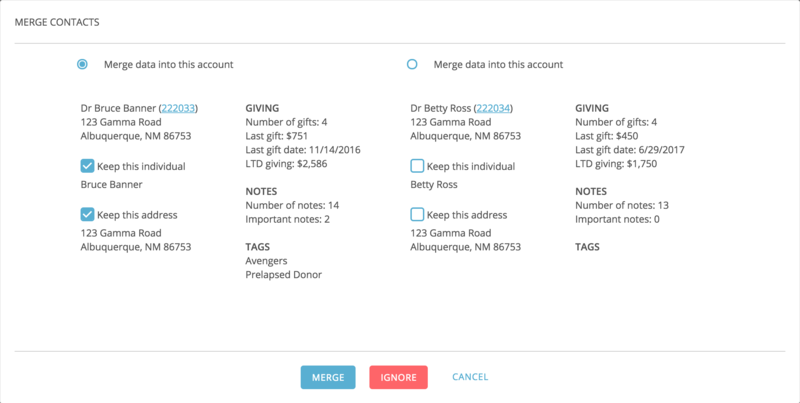 Once the search is complete, the Merge Contacts screen will list all possible duplicates in your system. If the search was run some time ago, select "Refresh" from the Actions drop-down to view updated results. Click on any record to see possible duplicates listed below, and then click on "Compare" to select a duplicate and access the merge screen. While Virtuous can identify potential duplicates, sometimes you may identify duplicate records in the system and wish to merge them right away. In these cases, make note of the Contact IDs for each of the two records you wish to merge. Then, navigate to the Merge Contacts screen, click on Actions, and select "Manually Merge Contacts" from the list of options. This will bring up the Manual Merge form. Enter the two Contact IDs for the two records you wish to merge, and then click "Compare." Regardless of the method used to identify duplicates. once you have clicked the "Compare" button, you will be taken to the merge dialog box. First, using the radio buttons at the top of the form, select the correct Contact ID to be preserved. When merging Contacts, one Contact ID will be preserved, and the other will be archived. After selecting a Contact, then carefully review the items with checkboxes. Users have the option of preserving any Individuals and including them in the new, merged record. In the case of duplicate Individuals, it is generally best to choose whichever Individual has more associated Contact Methods. In addition to selecting Individuals, users will also have the option to preserve any addresses included with either Contact. Data listed on the right side of each record, including any Notes, Tags, and Gifts, will automatically be merged into the new, combined record. When using the Virtuous duplicate search, it is possible that two records that are not duplicates may be flagged as potential duplicates. In these cases, from the merge dialog box, click the red "Ignore" button. Clicking "Ignore" ensures that Virtuous will not show a particular pairing as potential duplicates again. This means that, over time, the accuracy of the duplicate search should improve.